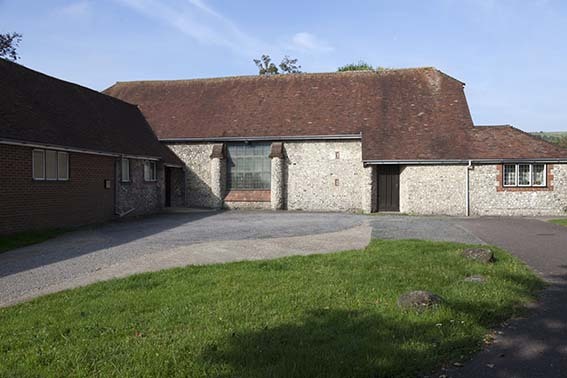 As the houses of Coldean estate spread up the Downs, a barn, probably late C18, which had belonged to the farm formerly on the site, was adapted as a church by J L Denman (BE(E) p264); the rounded buttresses on the north side are characteristic of his work. The re-use of an existing building is in contrast to other estates in the area, where wholly new churches were built. The foundation stone was laid on 2 April 1955 and the dedication was taken with a slight change of spelling from the then recently demolished church of St Mary Magdalene, Bread Street (Shipley p18). 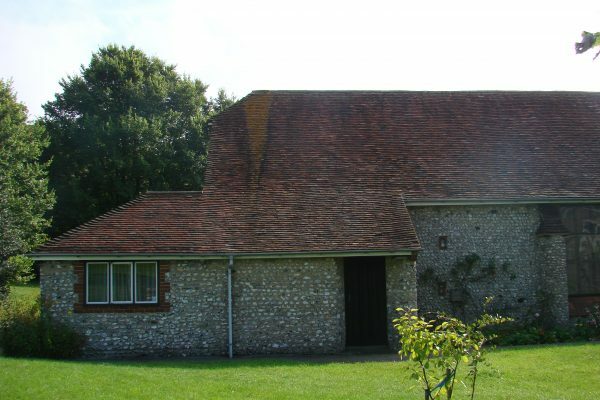 The flint walls, braced tiebeam roof and half-hipped gables of the barn remain and large windows are set in the former cart-openings on each side. New work, also flint, includes a west doorway, with vestries there and to the north, which extends to form a hall. Retable: Sir J N Comper, 1896-97. It is all that survives of his high altar for the bombed church of St Anne, Upperton Gardens, Eastbourne and shows his early style, influenced by German late gothic.